56x22x21. 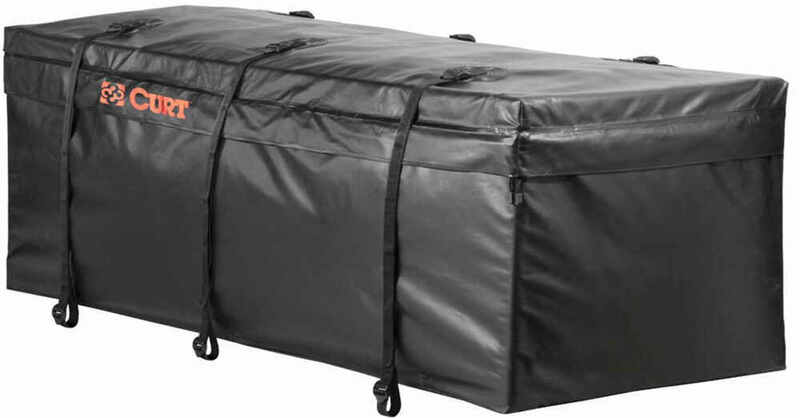 Store gear on your hitch-mounted cargo carrier with this waterproof cargo bag. Heavy-duty vinyl fabric, welded seams, and a zipper flap keep gear clean and dry. Durable straps secure to the carrier and tighten at 6 points for a snug fit. 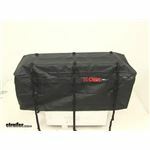 Call 800-298-8924 to order Curt hitch cargo carrier bag part number C18211 or order online at etrailer.com. Free expert support on all Curt products. 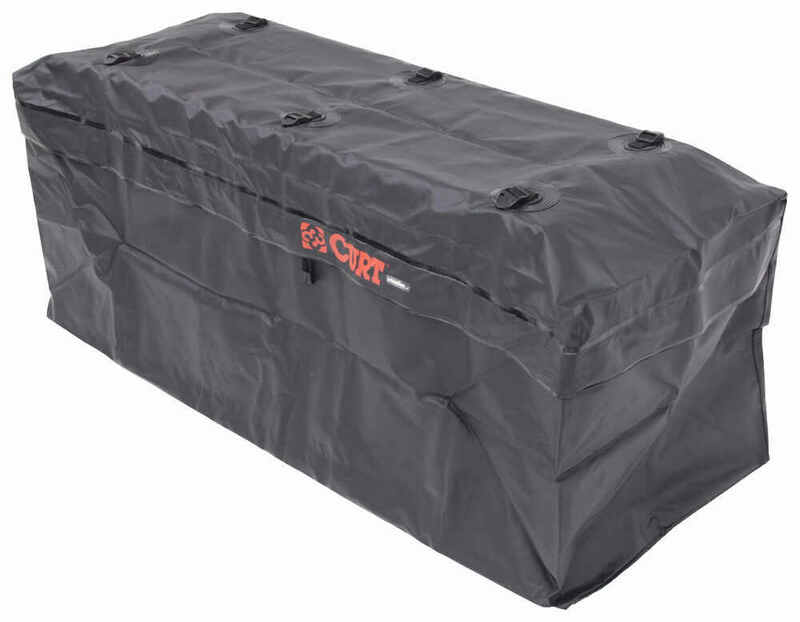 Guaranteed Lowest Price and Fastest Shipping for Curt Cargo Bag for Hitch Mounted Cargo Carrier - Waterproof - 15 Cu Ft. Hitch Cargo Carrier Bag reviews from real customers. This waterproof bag fits in your vehicle's hitch-mounted cargo carrier and holds your gear, leaving more passenger room and trunk space. 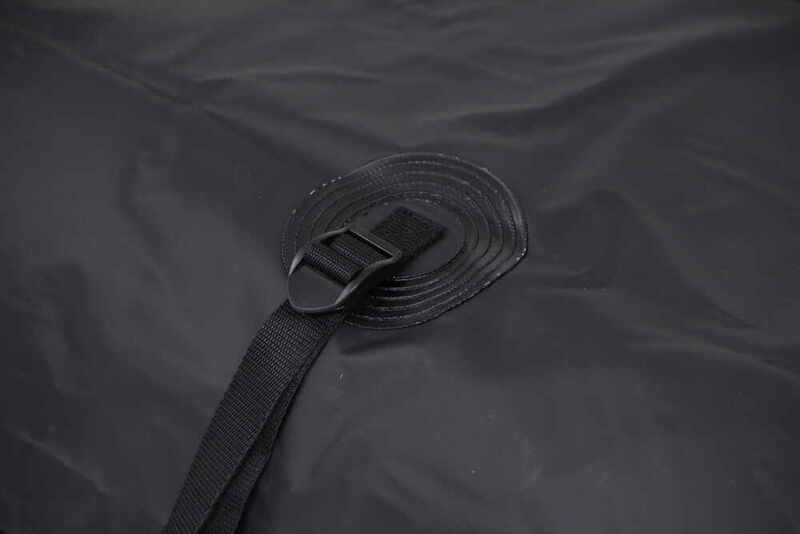 It is made of a heavy-duty material with welded seams and zipper flaps to keep your cargo dry. It opens on the front and side for easy loading with zipper pulls that can accommodate a padlock for added security. Position the bag in your basket and load the bag with cargo. Then zip up the bag and secure the zipper flap. 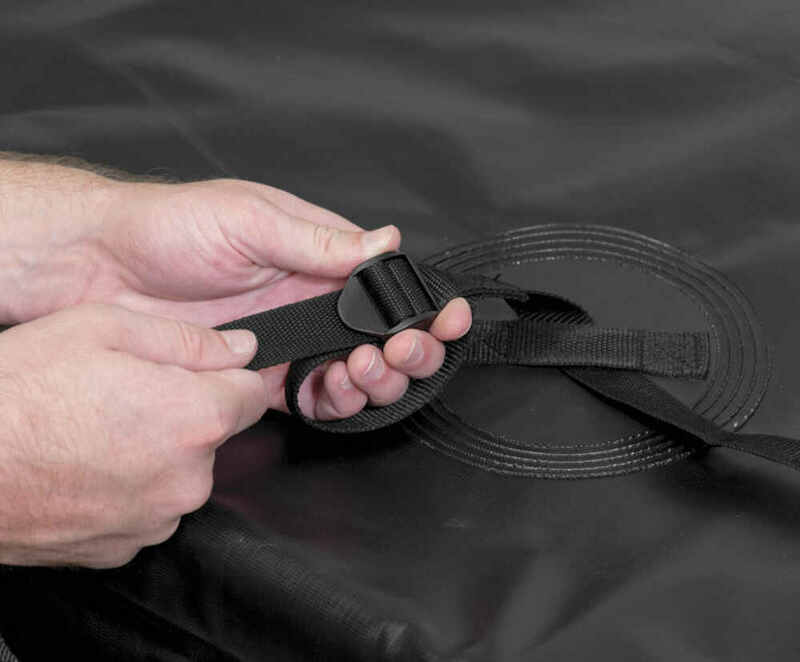 Adjust the integrated polypropylene straps on the bag to the length needed. Then wrap each strap around the bars of the cargo carrier so that the bag is secured at 6 points. Tighten the straps with the sturdy plastic buckles. 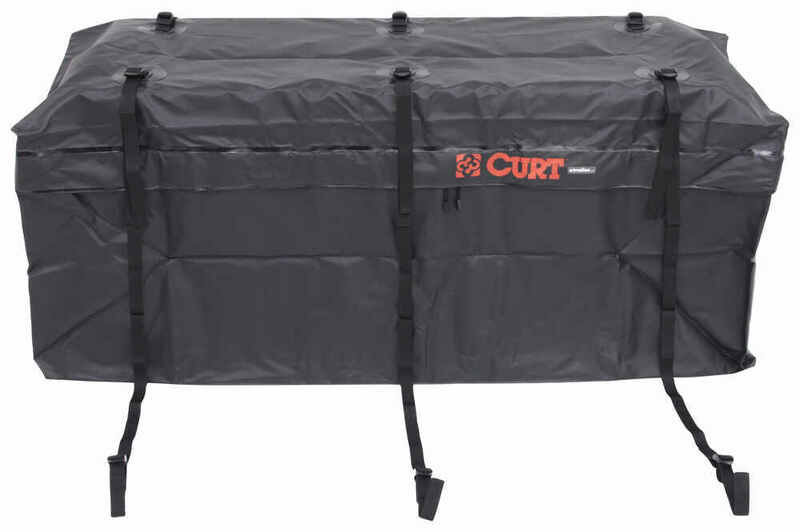 Today we're going to be taking a look at the Curt cargo bag for hitch-mounted cargo carriers. 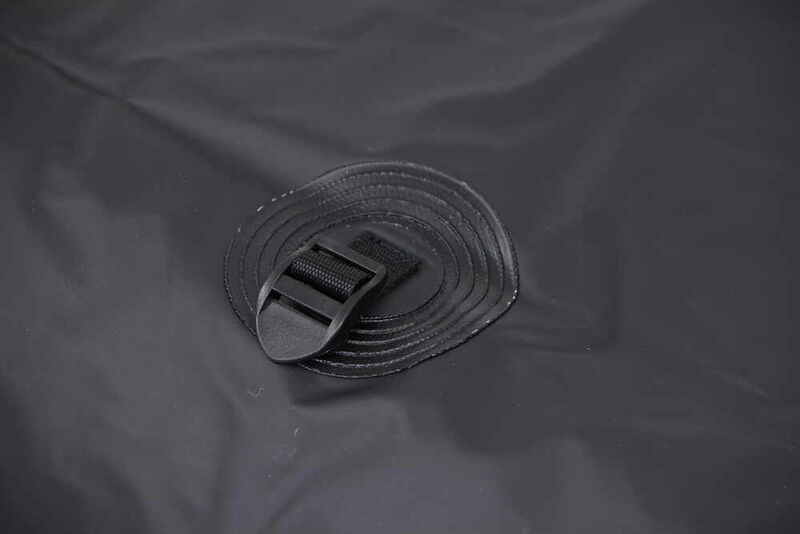 This is a waterproof soft-sided cargo bag that's going to hold up to 15 cubic feet of gear on your vehicle's hitch-mounted cargo carrier. This particular bag is designed to fit Curt hitch-mounted cargo carriers that measure 60" long. This material is going to be a heavy-duty vinyl fabric that's designed ultimately to protect your items. It's designed to keep water, dirt and debris out of the inside of the bag. It's a strong, durable design so it's going to resist tears and punctures. It's also designed to block UV rays, which is going to protect the bag and the contents from sun damage and fading. I do want to mention that the unit's going to feature welded seams, which is going to help prevent water leakage. It is a completely waterproof design. It's got this nice flap right here that actually goes over the zippered area, so when it's raining or if it gets wet, that water's going to run off and it's not going to be able to go back up and get into the bag. That flap does a great job at keeping dirt and moisture from seeping and through the zipper. 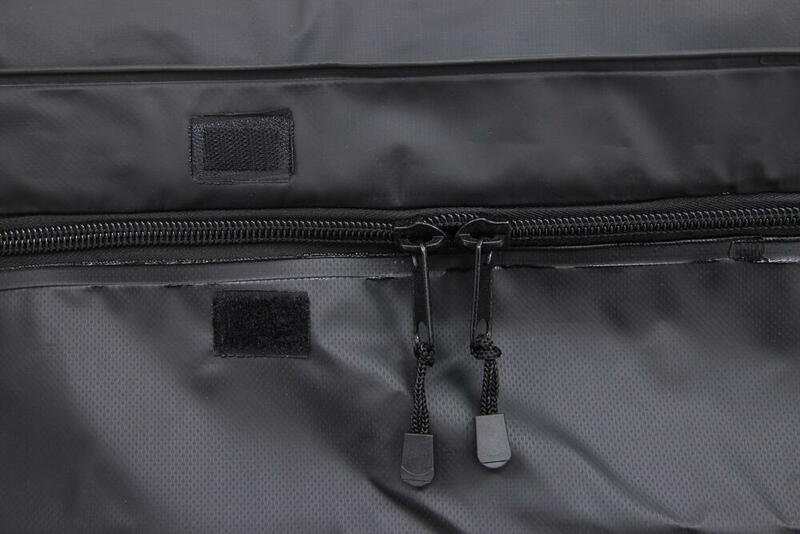 Then it's got these hook and look fasteners at numerous points around the bag, very similar to Velcro. Those go over and they keep that flap down over the zipper. The bag does unzip three quarters of the way, so that means that the sides will unzip and the front will unzip. I'll rotate this around and you'll see that the zipper or the flap. That's not located on the back so the back is just that vinyl construction. No flap or zipper on the back side. The bag does unzip three quarters of the way around for easy access. The zipper pulls, our zippers are located right here. Those zipper pulls are going to have holes located on the end of them. That's going to allow you to pass through a padlock. That way it's going to help guard against theft. The diameter of the hole is around 3/8" of an inch, so a lock that has a shackle diameter smaller than that measurement will work for this unit. A padlock or cable locks are sold separately. The unit's also going to feature the UV resistant straps. These are going to tie the bag to the cargo basket. That's six different points for a very secure fit. That's a durable woven polypropylene fabric. The unit's going to contain plastic buckles that's going to let you tighten the strap so it eliminates slack. You can tighten the strap up here towards the bag. This end would simply, it's got a loop created in it so you loop that around the cargo basket. Then you just pull that strap tight to get a nice tight secure fit. When the bag's not being used, it will fold up pretty compactly for a nice compact easy storage. The vinyl material is black in color. 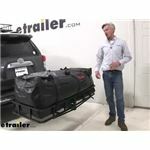 This is designed for hitch-mounted cargo carriers at least 56" long by 22" wide. Again, this bag is going to offer a storage capacity of 15 cubic feet. When it's fully stuffed or fully filled, the overall dimension's going to be 56" long, 22" wide, that's front to back, by 21" tall. Your straps are going to measure pretty close to 5' long and are going to have a width of 1" wide. 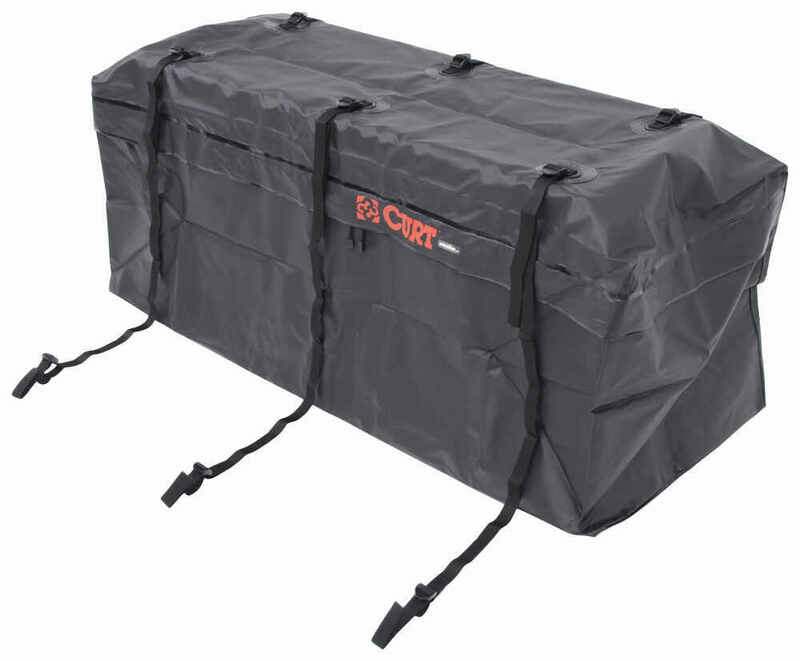 That's going to do it for today's look at the Curt cargo bag for hitch-mounted cargo carriers/. Order: RelevanceNewestRating - High to LowRating - Low to High 56x22x21. 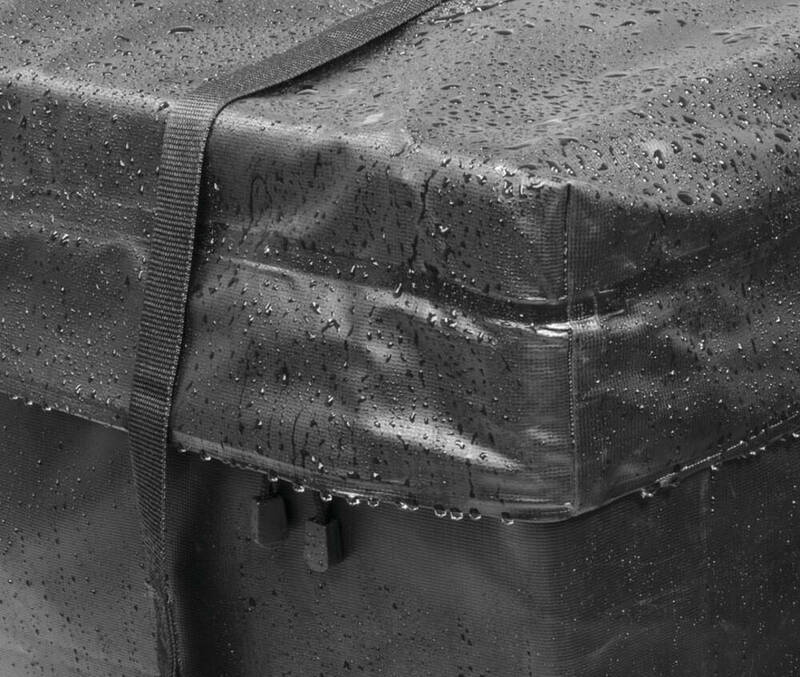 Store gear on your hitch-mounted cargo carrier with this waterproof cargo bag. 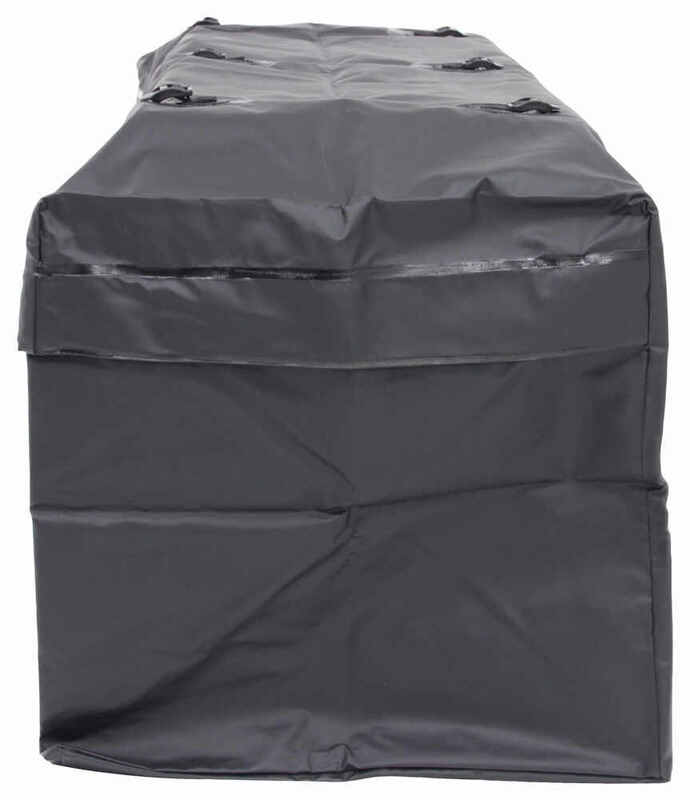 Heavy-duty vinyl fabric, welded seams, and a zipper flap keep gear clean and dry. Durable straps secure to the carrier and tighten at 6 points for a snug fit. What Cargo Carrier fits on a 2017 Ford Explorer With a Moonroof? The 24x60 Curt Cargo Carrier # C18153 is made in China. Curt has cargo bag # C18211 that you can use with this carrier. I have linked videos for both products for you. What Trailer Hitch and Cargo Carrier are Available for a 2015 Chevy Captiva? You would want to go with a narrower bag like the Curt part # C18211 as it is 22 inches wide and would fit better between the cab of your truck and the fifth wheel hitch. 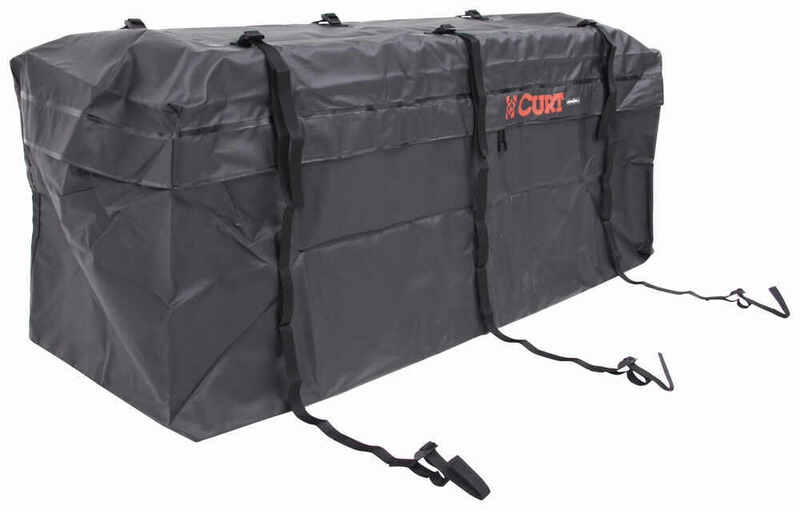 The Curt Cargo Bag for Hitch Mounted Cargo Carrier # C18211, that you referenced, weighs 7.8 lbs. 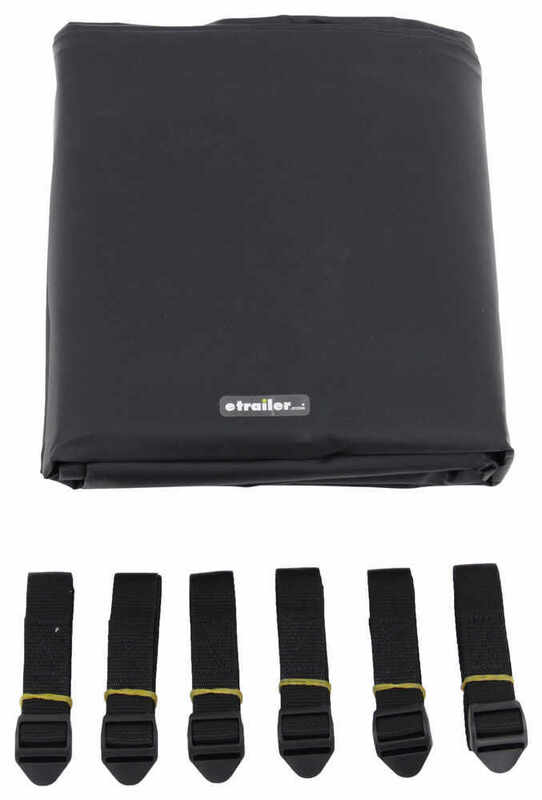 It is made of a heavy-duty vinyl fabric that has welded seams to help prevent water leakage. 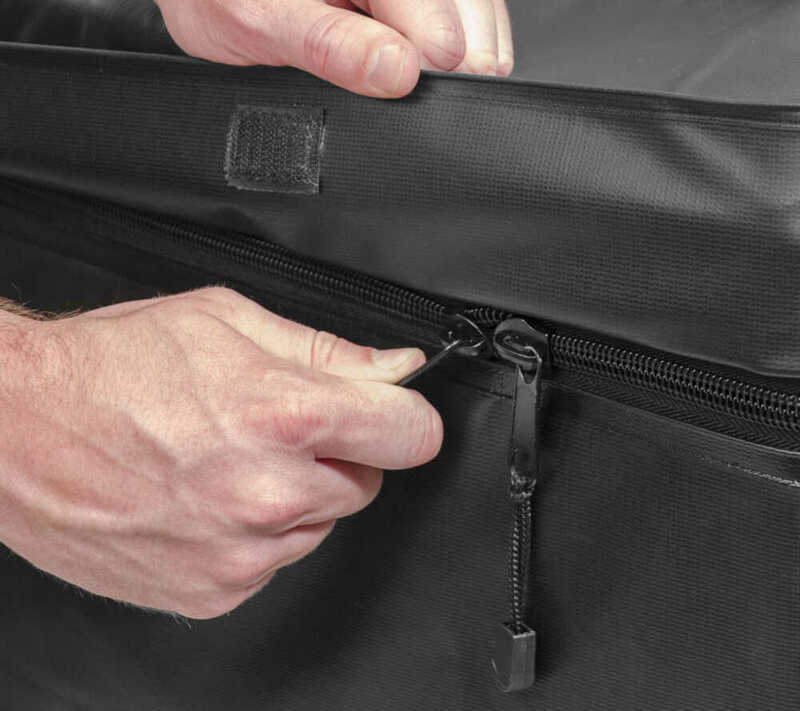 The zipper has a flap that goes over it as well to help protect your cargo from water, dirt, and debris. This cargo bag comes with a 1-year limited warranty. 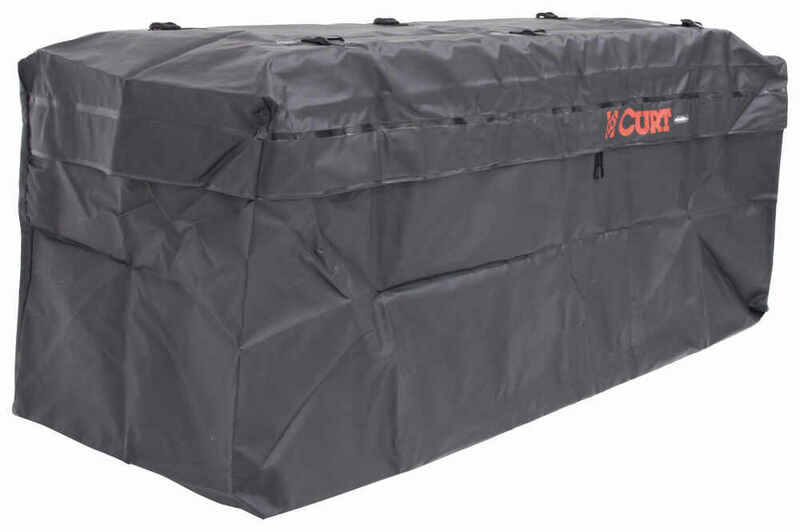 The Curt Waterproof Cargo Bag # C18211 offers 15-cubic-feet of internal volume capacity and measures approximately 56 long x 22 wide x 21 tall. 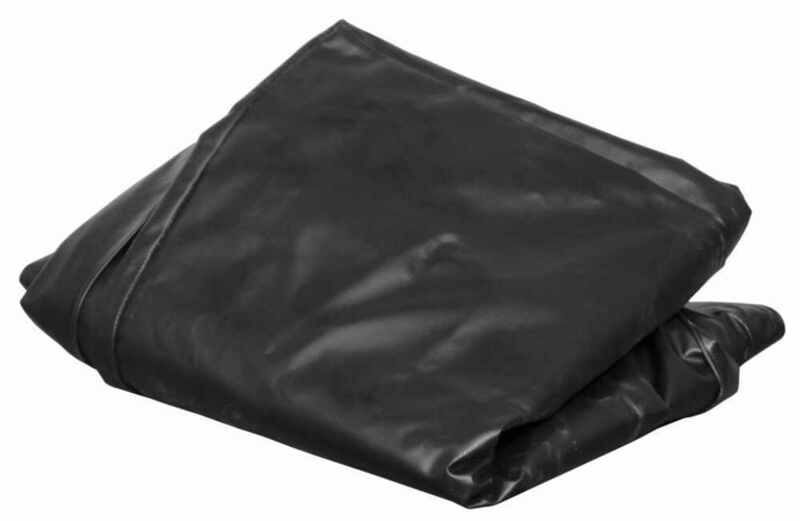 A nice feature of a soft vinyl cargo bag like this is that its shape is to a degree dependent on the items you load into it.